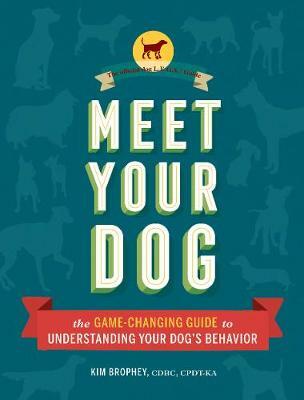 "Meet Your Dog is an original book that will lead even the best of us dog people to think about both dog behavior and our own behavior in new ways. It is an important book that creates a bridge between behavior science and its daily practical application by dog owners and trainers. I truly wish I had had this book to read fifty years ago." "In Meet Your Dog, nationally known behavior consultant Kim Brophey introduces L.E.G.S. (Learning, Environment, Genetics, and Self), an innovative model for understanding how dogs think and why they behave the way they do. Based on the latest findings in the field of canine cognition and behavior, this book is an invaluable resource, both for experienced dog lovers and for individuals seeking their first four-legged friend." "It's refreshing to finally find a book that takes into consideration the many predispositions to behavior problems in dogs. Many written works and theories do not take this into account, yet it is one of the major keys to understanding, and subsequently changing, canine behavior. This book is unique as it considers the whole dog. Dogs are different. They have different personalities and breeds have specific tendencies. Kim does not ignore this. On the contrary, she teaches us simple and practical ways to use these differences and tendencies to not only give dogs a better life, but also to have a more harmonious relationship with their human. This publication is a game changer because it teaches us to really see the dog in its entirety. It present us with a framework to understand all the major factors that are essential in understanding canine behavior." "Whether you have a dog, you are thinking about getting a dog, or you are a dog professional-there is something for you in Meet Your Dog! Packed with good advice, both in general about dogs, but also specifics about breeds and canine behavior challenges, you will be prepared and more confident to take on the responsibility of having a dog in our modern day lifestyles. Meet Your Dog and the LEGS approach is certain to be an enduring contribution to the dog training field." "In a sea of dog-behavior-information overload, Brophey's new book provides a refreshing perspective and innovative new paradigm for understanding how our dogs think and behave. A dog owner's or prospective dog owner's dream guide, "Meet Your Dog" dispels countless myths about dogs that keep them entrenched in a netherworld where they must be subservient, one-dimensional, and a "good dog" who welcomes overtures from people and other dogs; the book promotes respect for a dog's personal space, which is key to healthy dog-human relationships."